One of the first thing you notice in Odisha is the thriving culture of temple going. In every village, I see people praying at the temple early in the morning before they start off with their day’s work. The Tulsi Vrindavan outside every Odiyani home always has a fresh flower adorning it each morning. Odisha is one place where Sanatana Dharma rituals are preserved in all its sanctity and simple beauty. I visited the little known Chausathi Yogini temple in Hirapur this morning, a serene little temple located among verdant paddy fields near a small village. Built between the 8th and 10th century CE, the small temple is special for many reasons. 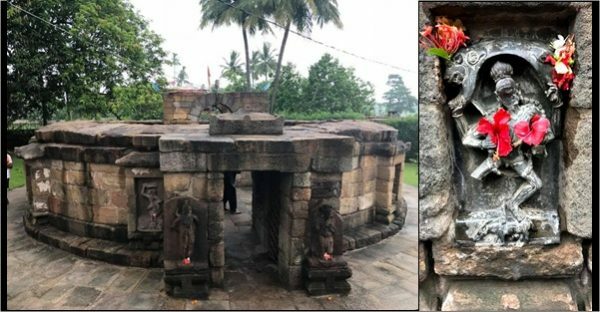 For one thing, it is one of the four ancient temples dedicated to the 64 Yoginis found in India, two are in Odisha and the other two are in MP. It is an open to sky temple that would look like a Shiv lingam if I had managed to take an aerial shot. The square Chandi Mandapa in the middle is supposed to represent the Shiv Lingam and the circular temple on the periphery, the base, representing the Yonipeetha. The temple is open to sky, like all Yogini temples are, as it was used for Tantric worship involving all the five elements that make up the Bhoomandala. The temple is supposed to have been built by the Bhauma queen Hira. The temple is built from locally hewn rough sandstone blocks, but the Murtis of the 64 Yoginis are carved out of chlorite schist obviously brought from outside. The 64 Yoginis embody the power of the feminine. Some of them are the Matrukas, the mother Goddesses, some like Vinayaki and Narsimhi, are Shaktis of the Gods. 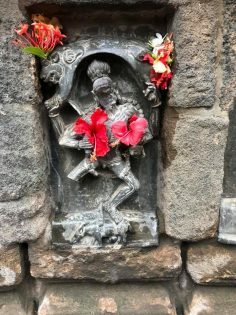 The 64 Yoginis are supposed to have been assisted Goddess Chamunda when she slayed the demons Chanda and Munda. The Murtis of the 63 Yoginis (one is missing) are stunning in their form and vigour. Unfortunately all of them have been vandalised by Islamic invaders. The temple was always known to locals, but was ‘discovered’ for the rest of the world by Kedarnath Mohapatra in 1953. When I walk into the 64 Yogini temple at 7 in the morning, the sky looks sullen and overcast. Monsoon has finally made its way to Odisha. As it is Saturday, local residents have already gathered at the temple for the weekly Pooja. Locally, the temple is known Mahamaya temple, as the central deity is Mahamaya. Unfortunately, you can’t see the main Murti now as it is hidden with cloth and flowers. It is a temple that is in worship again. I bow before the Goddess, a priest clad in a yellow dhoti ties a Kalawa in my wrist and gifts me a pair of red Shankha bangles, traditionally worn by married women in Odisha. There is a slow but steady stream of bhaktas, young girls, young men, old women, a family that has driven all the way from Bhubaneshwar, they all prostrate before the Goddess, offer bananas as offering and light tiny clay diyas filled with ghee. The priest chants the Devi Suktam, his voice reverberating in the circular temple. It starts drizzling, slowly at first, but the rhythm of the rain soon picks up, the open to sky temple glistens in rain. The Yoginis smile, cooled by rain. No one moves. Neither the priest, nor any of the devotees. We stand there, in front of the Goddess, waiting for the priest to complete his chanting. Soon, my sari sticks to my skin, but I don’t want to move. I feel cleansed and purified and powerful, surrounded by an amazing aura of feminine energy. 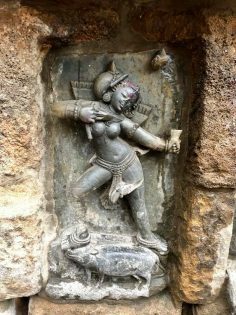 The 64 Yogini Murtis may be vandalised by fanatics, but the Shakti stays in Hirapur! 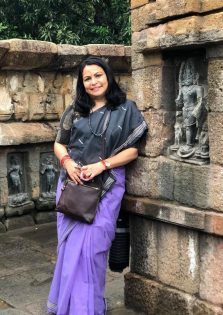 Shefali Vaidya is a Writer, Blogger, Newspaper Columnist, Textile and Temple Architecture Buff, Traveler, and Mum to Triplets.